Philip Taaffe, Cape Sinope, 2006–2007, mixed media on canvas, 114 x 97 1⁄8". IT’S NOT SO EASY to recall that first hit, that immediate emotional and intellectual warp one felt when confronted by Philip Taaffe’s transformation of a Barnett Newman or a Bridget Riley in the mid-1980s. Maybe that’s whatand whoretrospectives are really meant for: the artist’s original audience who, sent back in time, revisits its initial experience of the work. 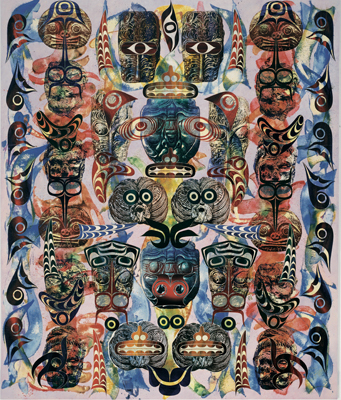 For some, Taaffe’s early paintings were highly provocative; but for all the attention they first generated it’s clear now that they were often misread. When those early paintings are seen again and in relation to all that came afterwithin his full body of workthey seem less provocation than invocation, less a nihilistic statement on the “end of painting” than a direct engagement with history and the act of painting.